POLICE ACTIVITY: Osuna and the Railroad Tracks. Armed Suspects shot at police multiple times and flee into neighborhood. ALBUQUERQUE, N.M - Just after 4 a.m. a DWI officer attempted to stop a vehicle for a possible DWI near Jefferson and Osuna. As the officer tried to get the vehicle to pull over, the driver fired at least three shots toward the officer. The driver then fled westbound on Osuna and fired at least two more shots at the officer. 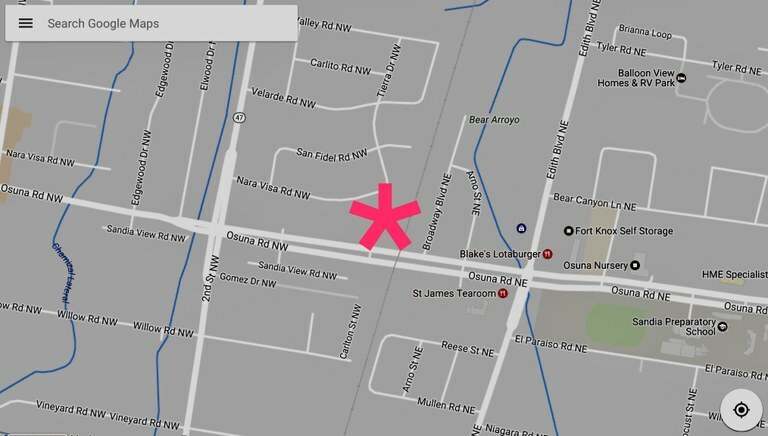 The offender then ditched the car near Osuna and the railroad tracks (see map below). Two men, the offenders, were seen running into the nearby neighborhood. APD is conducting an area search for the suspects. We are asking people to stay inside their homes, and please call 911 immediately if you notice anything suspicious. We believe both offenders are armed and dangerous.